London, ON, April 4, 2014 – On March 26 & 27 the pork industry gathered for the fourteenth annual London Swine Conference (LSC). Attendance over both days was strong, with 320 attending Sow day and over 200 for Wean to Finish day. Producers made up over 50% of the audience on day one and 35% on day two. Positioning for Success was the theme of this year’s LSC. Experts from across the North American Swine industry made an impressive line-up of speakers. Attendance levels for this two day event continue to illustrate the value of the conference for primary producers and industry alike. 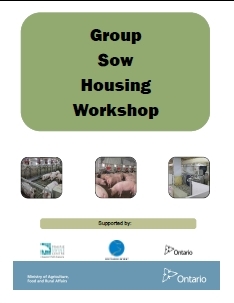 Speakers highlighted aspects of loose housing of sows, disease issues, herd management, health, reproduction and nutrition The LSC program delivered a balance of new ideas and evolving science with practical on-farm applications. Workshops used teams of presenters to provide a varied perspective on each topic. The interactive nature of the workshops helped participants to compare and contrast their own operation to the examples presented. In the big picture, presentations on market position, international trade and disease monitoring helped to round out the conference agenda. This year the conference moved to the Hilton London and received numerous positive comments from attendees about the new venue. A new reception format saw a named sponsor hosting the industry reception on Wednesday afternoon and this was very well received. Conference proceedings will soon be available online at www.londonswineconference.ca along with proceedings from all past conferences. The planning committee extends their thanks to Premier Sponsors: Total Swine Genetics Inc., Zantingh Direct Inc. and Better Pork Magazine. The support of these and over 30 additional industry sponsors make it possible for LSC to continue as a premier education event for the swine industry in Ontario. The London Swine Conference began in 2001, and continues as a joint effort of the University of Guelph, Ontario Pork, the Ontario Pork Industry Council and the Ontario Ministry of Agriculture and Food and Ministry of Rural Affairs. Its main aim is to provide a forum for the exchange of credible, science-based information for decision makers and influencers in the pork industry, to encourage the exchange and adoption of knowledge for the betterment of the industry.